Danny going big on the Tres Saltos. 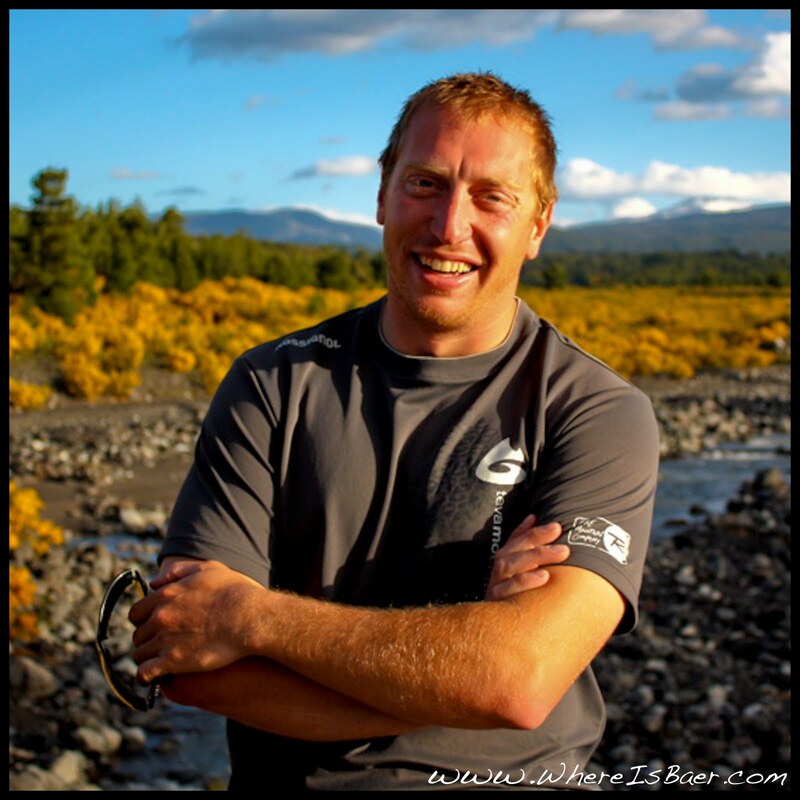 When David Hughes approached me about doing a kids kayak camp for his Pucon Kayak Hostel I fumbled my response. I had never taught kids, or a camp. My personal philosophy took over: swing for the fences. "I could do that," I thought. 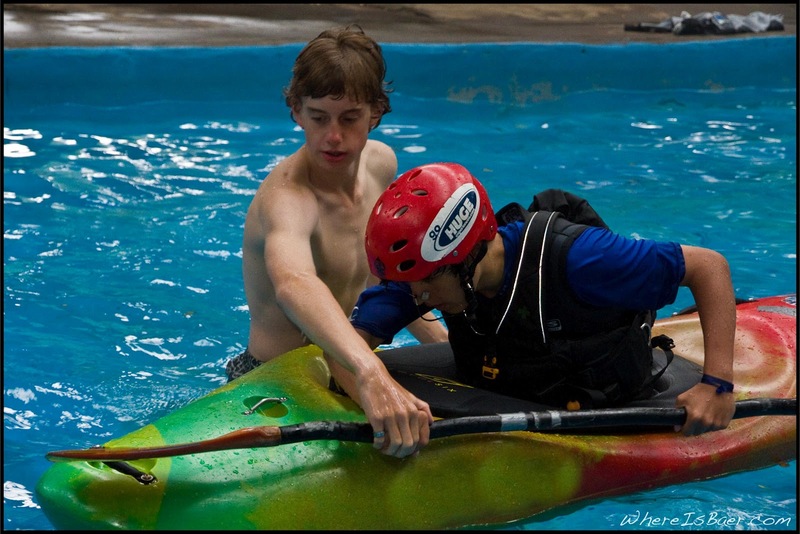 "Teach kids how to kayak, how hard could it be?" Over the last few years I have taught a fair amount of adults how to roll, teaching kids couldn't be much different. I was in for a major learning experience myself. 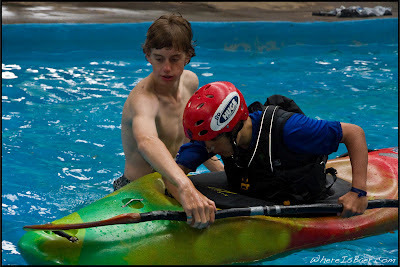 Danny and Lucas, kayaking the Rio Machine. The students, Lucas, 15, and Danny, 13, are brothers from Santiago. Both had rafted before and done a tiny bit of kayaking. 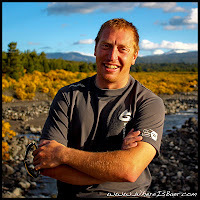 We started the instruction from scratch, talking about all the gear, why we wear it, and how to outfit a kayak. We got them suited up quickly and headed to Lago Caburgua where we began a roll clinic. There were more distractions then I could imagine, the kids splashing, parents looking on, and breathtaking scenery. 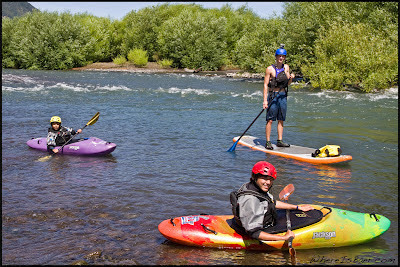 The initial roll clinic went well, and the kids attention was quickly turning more and more towards kayaking. Eric teaching Lucas to roll in the hot springs. 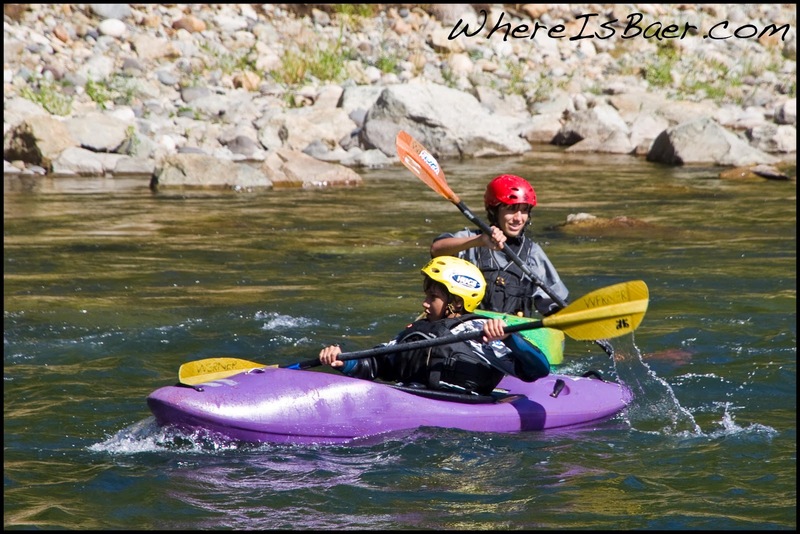 Paddling with people at an entirely different skill level is challenging, and taking them to a river that I have never paddled before was slightly frightening. The smiles on their faces were exhilarating as we all peered around corners, not sure of what was next. 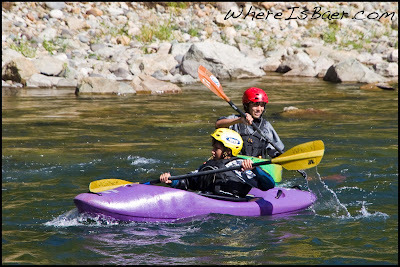 I never thought taking two class 2 paddlers, down a class 2 canyon could ever bring such enjoyment. Everyone was so excited for the next challenge. 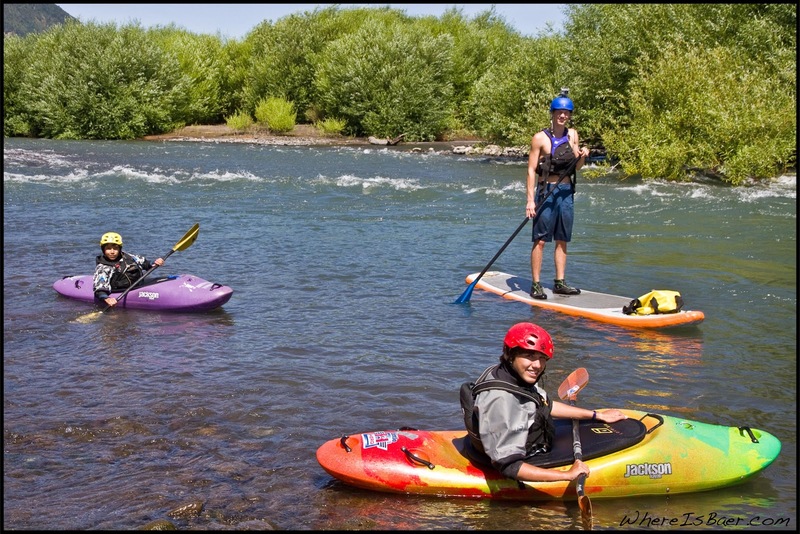 Kayaking and Stand Up Paddle Boarding the lower Trancura. It was difficult for me to find a teaching style suited for Lucas and Danny. It was my job to remove boundaries and perceived fears. I instantly reverted to river guide mode. We passed in and out of small eddies, rolled in the current, had the kids lead rapids, and find their own lines. By slowing down and teaching the simplest portions of kayaking I allowed myself to see the little things again. I had my eyes wide open looking for tiny eddies, spotting geological abnormalities, and understanding the group dynamics the next time I went kayaking on something "hard." Teaching truly is a learning experience. Lucas crashing through a wave on the Lower Trancura. We even had the kids write little stories about their experiences. 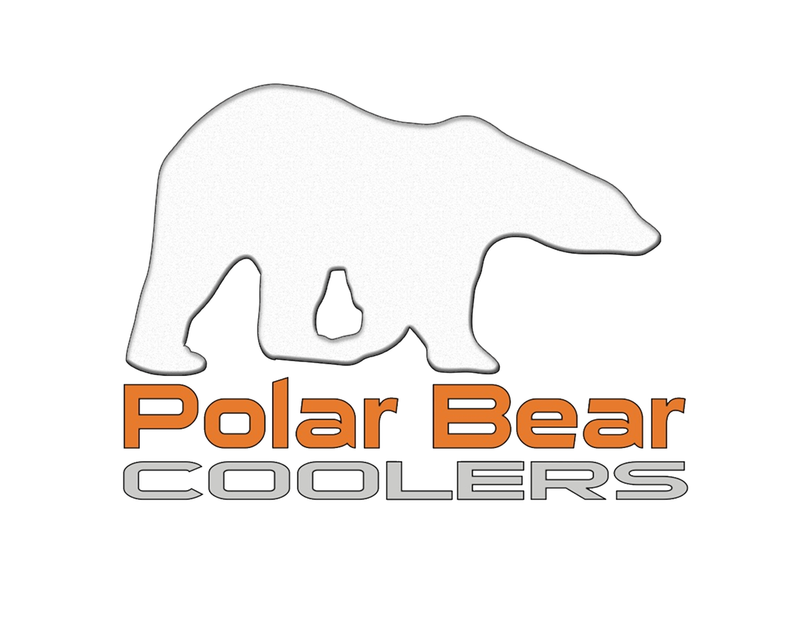 This took some serious prodding, but the end result is a simple view on their experience. 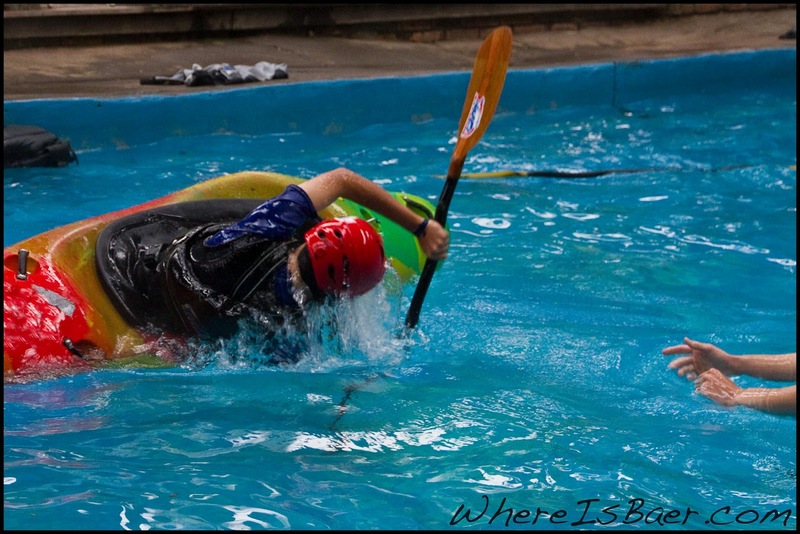 One would wonder how hard kayaking could really be, I thought it was a simple idea that relied on more physical power than knowledge. To my surprise, kayaking inhabits a world between these two things. A mere physical approach to the river would be possible, if not dangerous without the proper mind to "read" the river. Being able to see how a river moves and how it acts is invaluable in kayaking it. 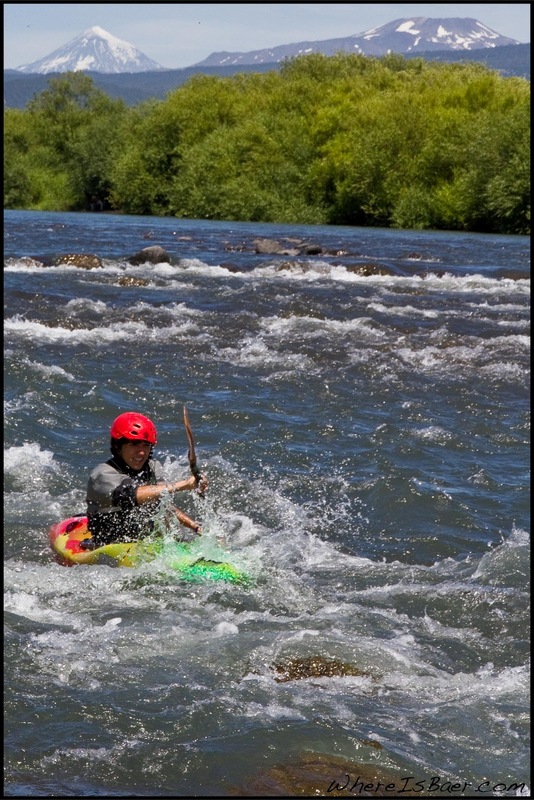 When i first started, i went on a beginner river, simple flat water. It could not have been simpler. 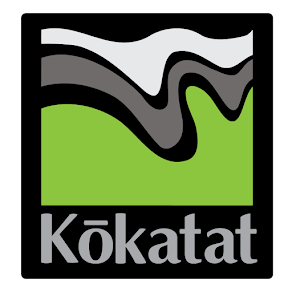 Kayaking left my mind for several years. Then my mom told me of a kayak camp in chile, a great chance to train with the same school my cousin learned all his tricks, though he stayed for a semester and i am doing it for a week. Lucas learning to roll in the Hot Springs. 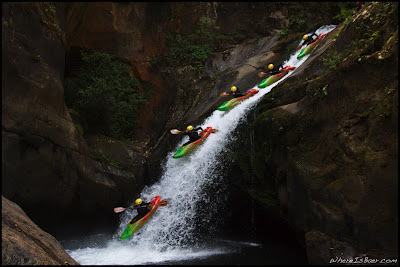 My first impresion of kayaking was that it was a merely physical sport, but it is also of dicipline minds, being able to focus as the vastly powerfull waves or rocks rush at you. Or as you flip into the cold water, you try to keep your mind clear as you perform the flip. The flip is a trick that i had to learn, since getting out of the kayak everytime one flipped would waste time that i did not have. 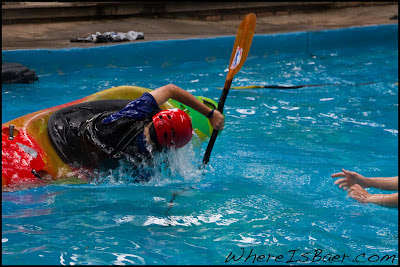 It was hard at first then i started to get comfortable with the hip snap and the paddle movement. I did my first flip on my second class, and my first combat flip yesterday. It was good that they made me rehearse the flip, i did it instinctevly right when i went under. Lucas practicing rolling in the hot springs. 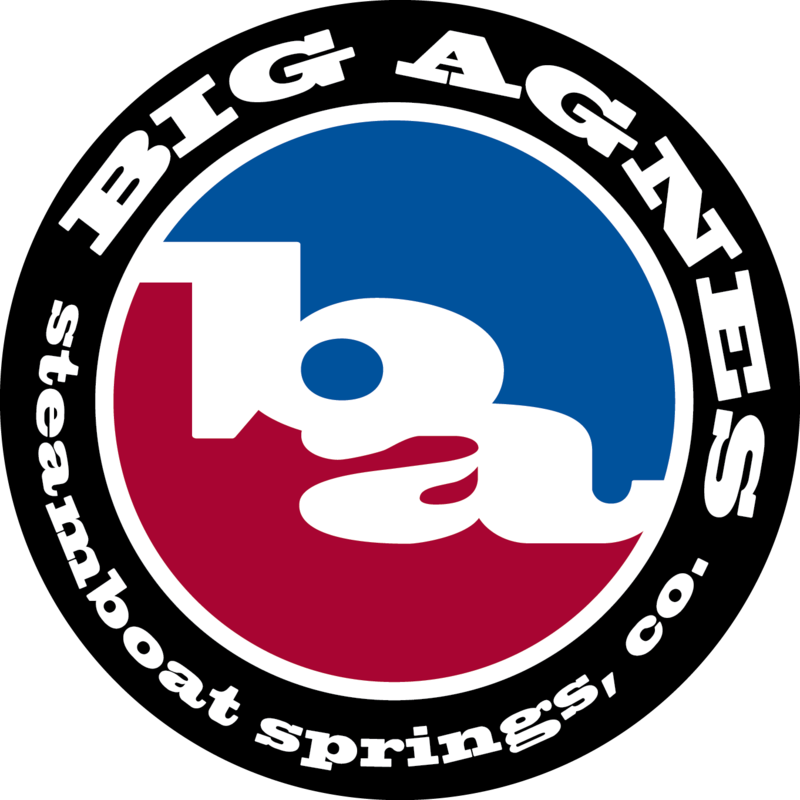 My kayaking teachers are Eric, Chris, and David Hughes. You could tell where there were rocks or how they were positioned underwater by just looking on how the wave forms. The lines between eddie and current become more clear, they usually have little whirlpools and move the opposite direction of the current. Almost all rapids end in a V, the bottom of the V pointing downriver. I almost got flipped once when moving on a strong current to a slow eddie, the change is very difficult to cope with while your kayak is rocking precariously, though I am still a beginner. Lucas firing up the top of the Tres Saltos. 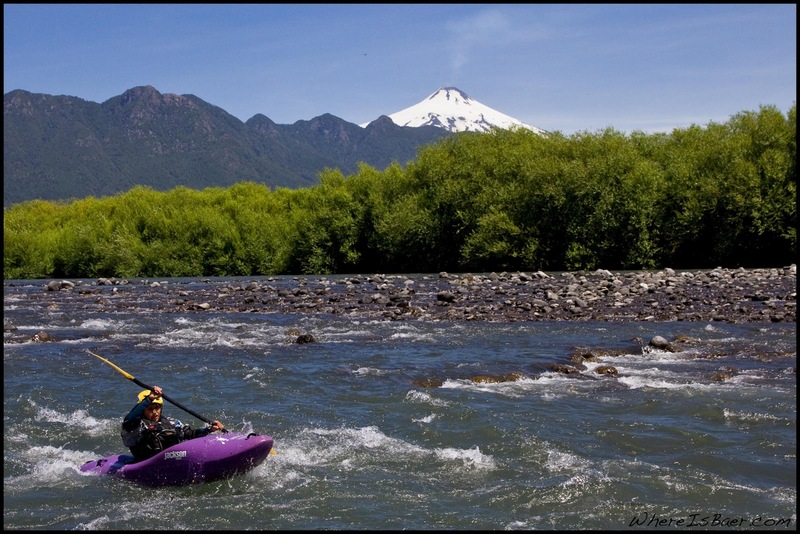 It is always awkward to enter a eddie, but if you lean upriver and do a stroke on the upriver side of the kayak it would smoothen your entry instead of the usual rolling. It was funny seeing all the whitewater horizons, which could mean a waterfall, though most of the time in our case it mostly ment a bunch of rocks. Eric would joke that they were waterfalls and my brother would pretend to be scared, though more like terrified. Before that we looked at some really tall waterfalls that would have bashed me against rocks and flattened me. Eric quizzed me and asked where i would go if i were on the river, i chose the left side, and apparently i would have run into a big pointy rock on the bottom if I were really on the river. That would not have been the best of days. Yesterday my brother, Steven, Eric, David Hughes, and me went on the Tolten river. 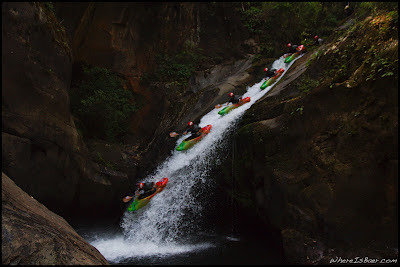 It was an easy river, few strong rapids. My brother did drift downstream after falling off the stand up paddle board. 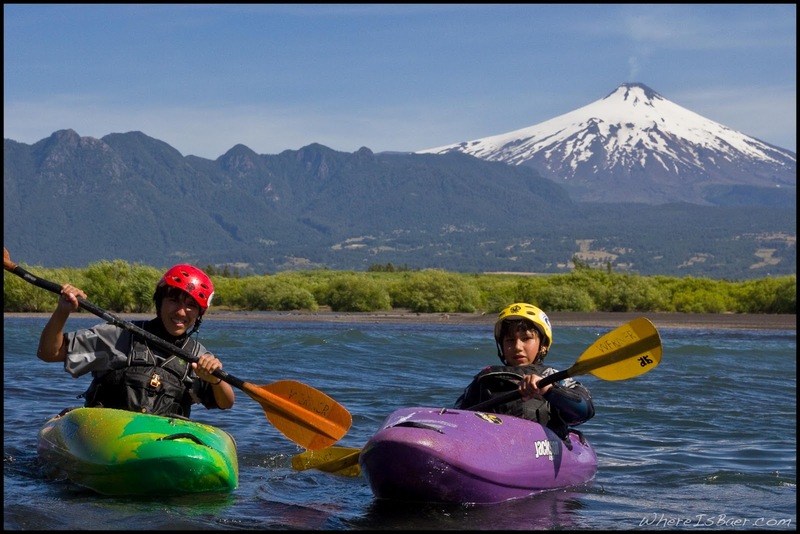 This camp is amazing since they know the rivers and Pucon has incredible views, kayaking with Volcan Villa Rica in the setting framed with picture perfect mountains. Literally crystal clear water that made the bottom visible. All in all, i would be sad leaving. Keep kayaking. 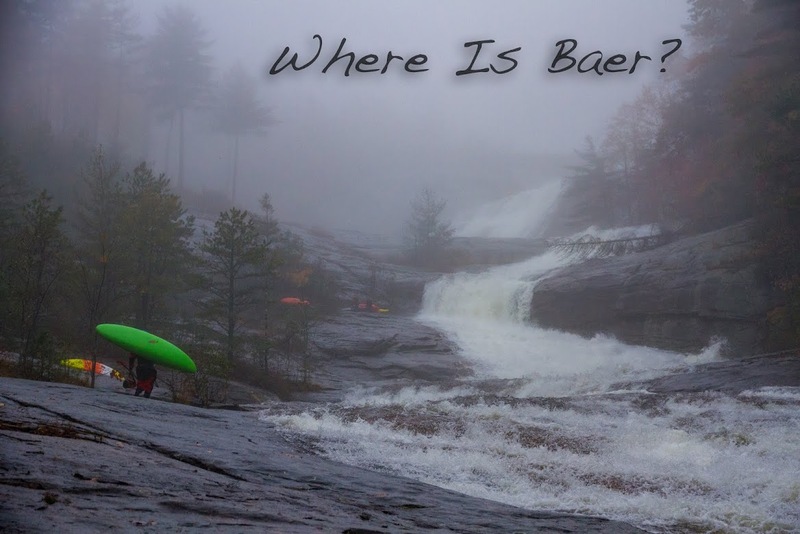 I first kayaked in Tennessee on the Ocoee river with my brother, I was about 9 years old. At first I thought kayaking would be easy but then I thought because of my size it was really hard for me. I was scrawny compared to my all american cousins who were paddling with us. I was even skinny compared to my cousin my same age. Danny in front of Volcano Viarrica. A few moments after I think of what I'm supposed to do I get flipped by my uncle, he wanted to see if I could get out of my kayak. I start to run out of my precious air, my mind is racing and I tap the part of my kayak that is out of the water. I had forgotten about the plastic handle that would allow me to escape my kayak. My uncle then flips me back up and says, "maybe you ought to paddle with out a skirt." I would never think that 4 years later I would be rolling like a pro and be in a kayaking camp. My first thought at the camp was were is the river? After a week I'm able to flip like a pro. The three things that I liked the most about this camp is that, my teachers would teach with a bit of humor. I also like that I can now surf the wave at the lake in my kayak. Another thing I like is all the amazing views of the landscapes and the animals I saw, like an otter and a strange bird and lots of fish, and lizards. All in all this camp has been the best camp I have ever been to. Daniel and Lucas's plane that would take them back to the city of Santiago was nearing, and the smiles on their faces were slowly fading. They wanted to stay, and their week of kayaking and adventure had enlightened the three of us.